Description: Under the sea, the mermaid princess wakes up to the sounds of her crying merbaby, the little girl needs to be bottle fed so she can go back to sleep. 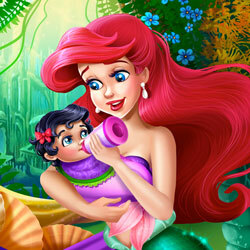 Help the princess feed her baby with some delicious warm milk, play with the merbaby and she will calm down. Redecorate her room in a cute style and the little merbaby will fall asleep.